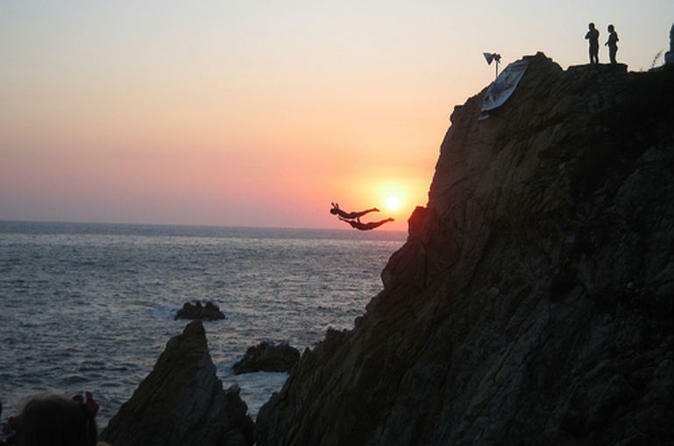 A trip to Acapulco is not complete until you witness the fearless cliff divers of La Quebrada! Experience the sophisticated atmosphere of the club La Perla restaurant and enjoy a gourmet dinner and drinks. This exciting evening takes place at the La Perla restaurant, which overlooks the cliffs from where the daring cliff divers of Acapulco risk their lives every night. The divers climb to a height of over 90 feet (30 meters), pray at the altar of the Virgin of Guadeloupe, and dive off the cliff at the precise moment when the tide brings in the large waves!